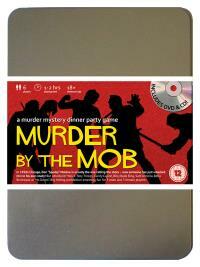 You've been invited to play the role of MO DOWN in Murder by the Mob. Chicago in the late 1920’s is overrun by the mob, most of whom have been invited to "Spudsy" Malone’s party. However, when the Don welcomed everyone to celebrate the invention of his new potato alcohol drink, he wasn’t expecting any of them to "do him a favour" and shoot him in the chest. Join with us to find out who whacked the big potato! "The Emerald Queen" - Irish Mobster (Spudsy’s sister cuts anything in her path!) Costume suggestion : Your emerald green suit may not be the pinstripe affair of many mobsters but it is a tribute to your heritage, as are any charm bracelets, pendants and necklaces you decide to wear this evening. Four leaf clovers and leprechauns are optional. You’re Spudsy’s younger sister, over from Ireland for a family visit. You weren’t surprised to see Spudsy doing so well – he’s always been an over-achiever. You’ve been having a grand old time sightseeing and getting to know Spudsy’s friends. In fact, you’re thinking about extending your visit for a while longer – maybe even moving over here for good!